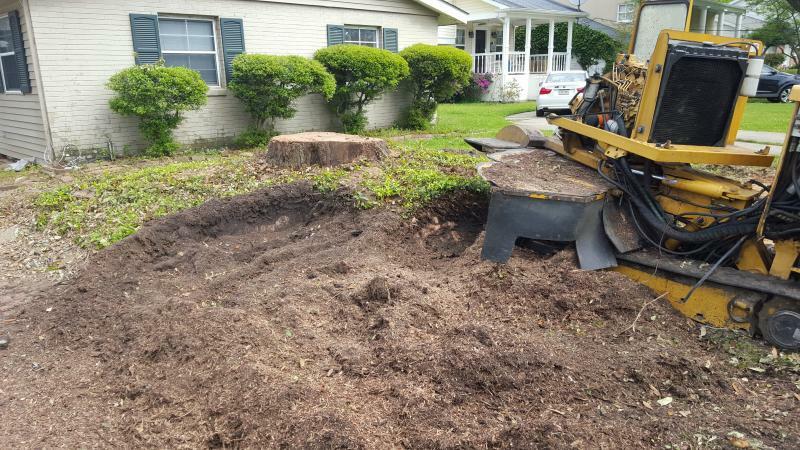 The series of pictures below takes you through a giant Water Oak stump removal. I go the extra mile to ensure that there are no buried surprises after the mulch is cleared. As you will see, large stumps on mounds covered by vines, grass, or other plants have a large network of buried roots. 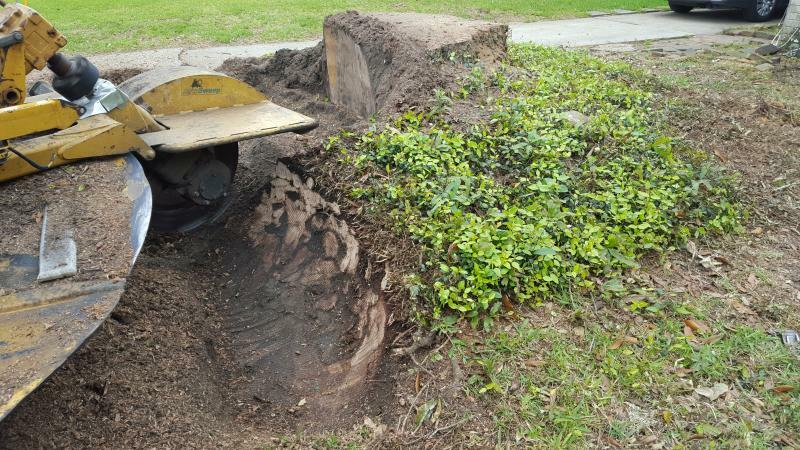 This is typical of most large stump removal jobs. 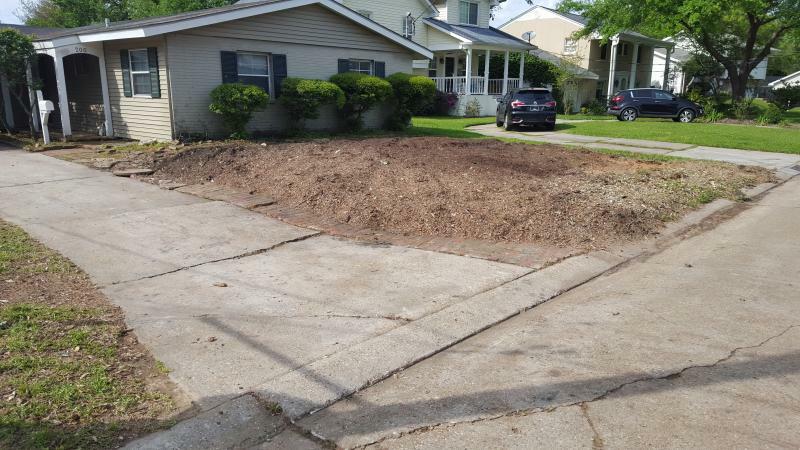 Have you ever noticed a yard where there appears to be a large crater with stray roots radiating from the perimeter of it? 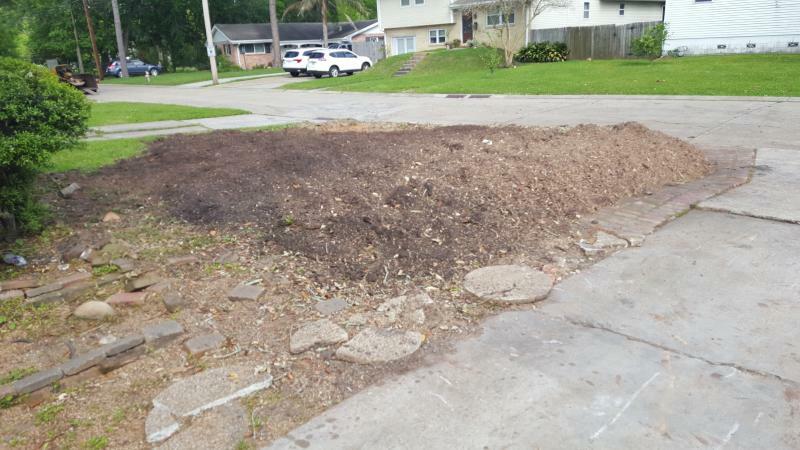 Have you ever seen a yard where there are flat tops of root and stump where the grass cant grow over it? 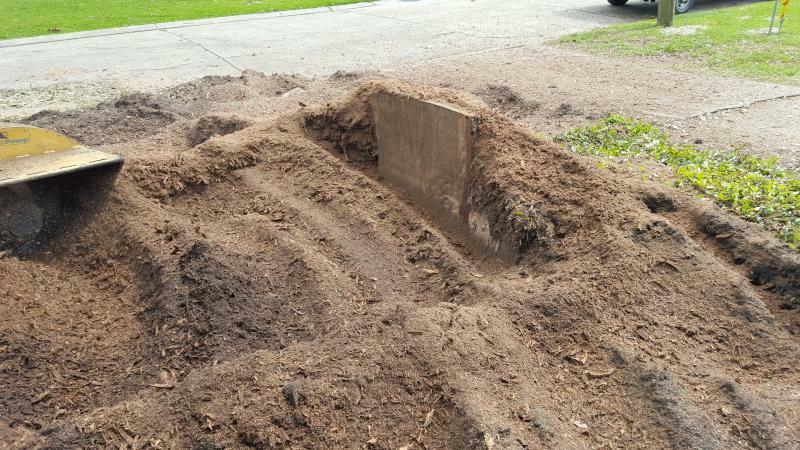 This is the result of other stump grinding services that only grind away at the main part of the stump without taking the time to grind into the surrounding root, or who didn't dig in below the surrounding grade. I don't want my customers to have those kinds of unsatisfactory results, so I use the techniques I demonstrate below. This attention to detail is what has earned so much of my great reputation! Safety comes first. Before starting a job like this, I have the property marked for buried utilities. While I am well insured, not making claims is what keeps my insurance premiums to a minimum! I hope you enjoy the following tour; scroll on down! The tree has been cut down and I arrive! Looks can be decieving. The top of this stump is about 40 inches across at its greatest width, but that is only the top! That mound is full of roots and extends out about 12 to 15 feet from center in each direction before meeting the surrounding ground level. Where you see the cutting wheel on my machine is where I start into the ground. 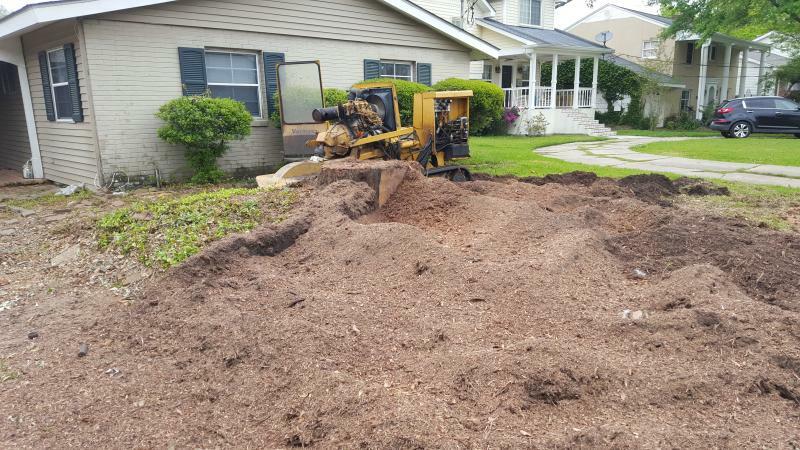 Other companies may start at the exposed part of the stump and only grind that, but as you will see in the following pictures, that technique only scratches the surface and leaves an almost solid mound that will result in your yard having a hill with a crater in the mddle for many years to come. Keep scrolling and see why. As you can see, there are plenty of roots buried under that ground cover. Over the years, someone has added dirt above the roots so this Jasimine could grow and hide them. It is like this under all of the elevated ground surrounding this stump. After working a few feet into the mound, I have moved over and started another run into the base. During the maneuver, I also use the machine to draw back some debris which allows me to cut deeper. I repeat the sequence as I go around the mound. As you can see here, the mound is mostly wood. 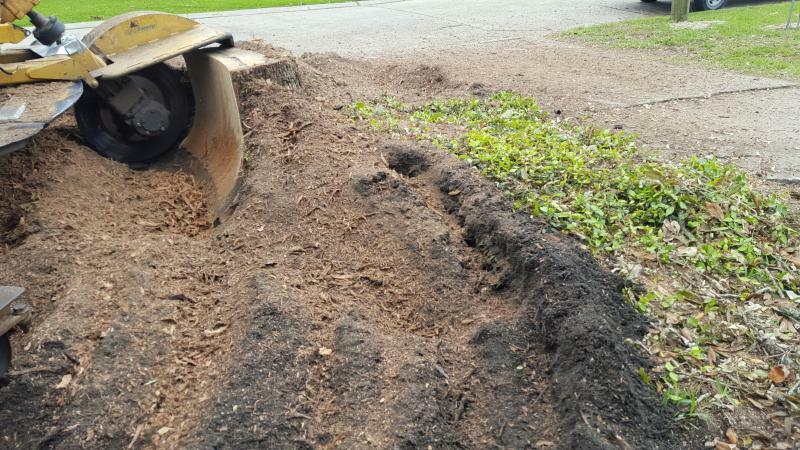 It actually takes more time to clear the mound than it does to grind the visible stump. Before you consider a cheaper price, compare what you are going to get for the money. I am about half way done in the above picture. Just behind the remaining stump slightly to the left is the safety cover over the cutting wheel on my machine. The bottom of the cutting wheel is about 16 inches below that. This means that there are little of any subterrainian roots left to rot and create holes later. Now, please look closely at the front of the house just to the left of the the shrub on the left. See that pipe coming out of the ground? That is the water line going into the house. Yes, that line runs right under that stump. Why choose me to do this job? Please consider the fact that I have over a decade of experience as a specialist in this business, the fact that I am well insured, the fact that I have never had to make an insurance claim, and my reputation. After getting enough of the mound removed, I can finally chew into the main part. I realise it is now obvious that this homeowner will need to redo her lawn, but as always, that is discussed beforehand so the customer knows what to expect. Not all jobs have a mound like the one that was here; each job is unique. That is why I am happy to provide no-obligation personal consultations to help potential customers make an informed decision. 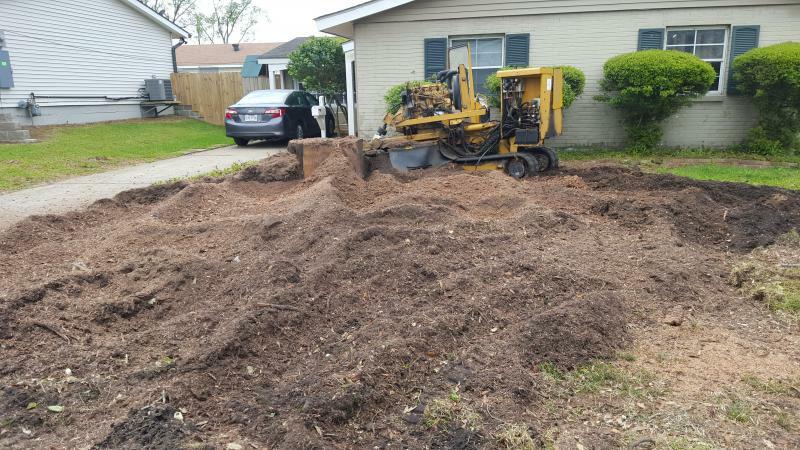 My large machine has the power to make mulch out of this old oak stump. 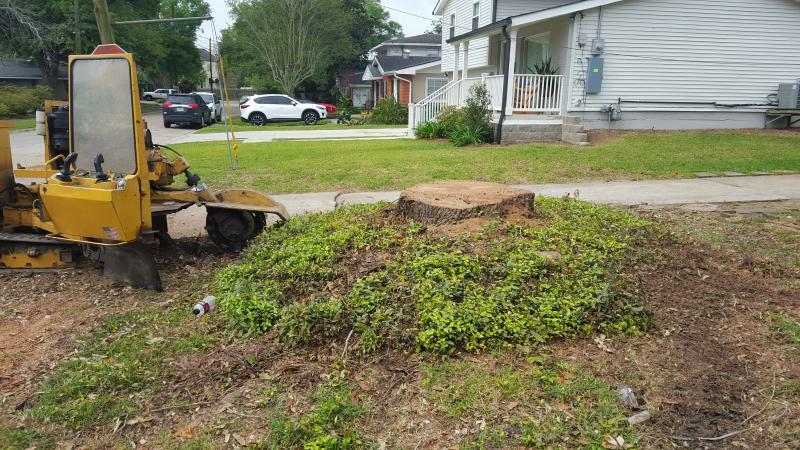 As with the surrounding roots, I go deep so there will be problem clearing the area to achieve a level yard as if the stump was never there. 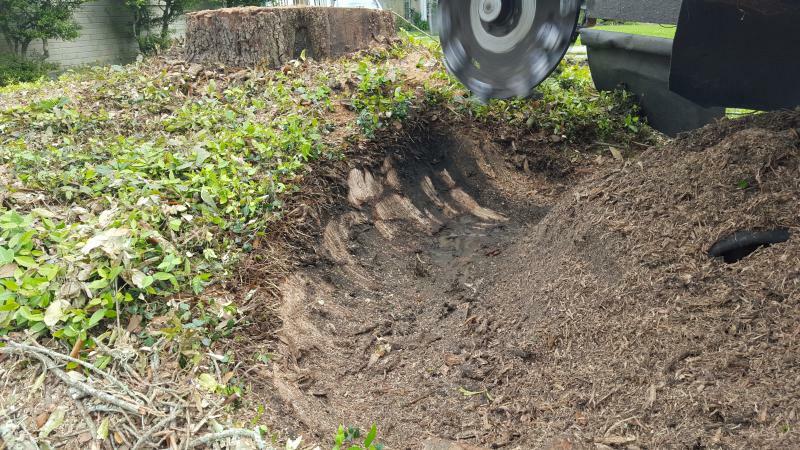 Several times, I will have to rake back the debris to be able to maintain a constant and thorough grinding depth. It is all part of the job! After grinding the remainder of the stump, I complete grinding any remaining mound. Once grinding is complete, I smooth the mound over and blow any debris off of paved surfaces and back into the mound. 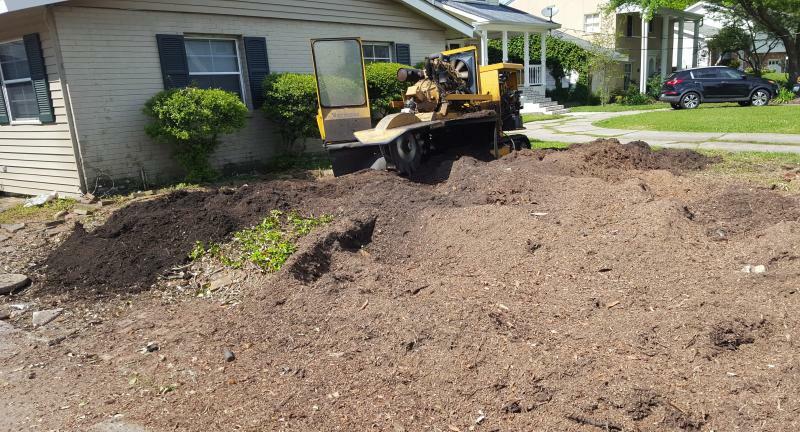 As a specialist in stump removal, I am not equipped to haul debris, but if you are interested in that service, I will be happy to recommend another contractor that can handle that job. Thank you for your interest in my services! Please call 504-858-5045 to set up an appointment for a free, no obligation consultation and price quote.